IT infrastructure plays the key role in a modern company. It is hardly possible to run business without using computers. Electronic mail, databases, computer acounting make our life easier and faster. Reliability cannot be achived without management of resources, in this case we mean IT Infrastructure on which digital services relay on. Lan Projekt Customers have trusted us for more than twenty years. 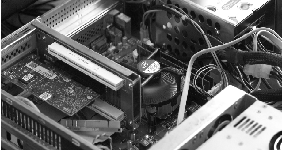 Lan Projekt takes care of IT Infrastructure such as servers, PC’s, communication networks and software. Our staff consists of reliable and experienced crew ready to protect and guard your data and IT resources. Such a solution will let business owners focus on core business without the need to spend extra time and resources on activities they are not accuainted to. Let professionals do what they are used to. The advancing computerization of companies naturally results in growing IT infrastructure.The services and systems that are critical for the operation of the entire enterprise are added year by year. The number of servers, files, databases and applications grows continually. Without their correct functioning, we are unable to run business. A failure of just one system – say, electronic mail – may hinder the operation of the entire enterprise. In order to foresee the possibility of failures and to protect against them, and in case of their occurrence – to respond as fast as possible, LanProjekt offers IT services and infrastructure monitoring services. Our administrators trace on an on-going basis, among others, database performance ratios, disk space occupancy, server and telecommunication lines operating parameters, as well as correct operation of backup systems and power systems. This lets them intervene in time to prevent the occurrence of failure. If need be, they propose increasing the capacity of systems and modification of parameters of service. The analysis of the collected data serves predicting the operation of monitored devices. This enables proposing the extension and replacement of old elements of infrastructure before their complete wear. 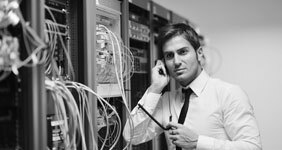 For twenty years, LanProjekt has supplied its clients with IT and telecommunication infrastructure solutions. We offer comprehensive IT services – including audit, analysis, design and implementation of computer systems. We implement solutions based on Microsoft’s applications, and for Internet services (e-mail, www), we use servers based on Open Source software: Linux and FreeBSD systems. In addition, we provide services integrating various systems. 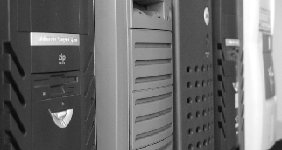 We cooperate with renowned suppliers of IT equipment – such as IBM or APC. We offer software of, among others: Microsoft, Comarch and Avast. Our offer of telecommunication services we enrich thanks to cooperation with TK Telekom companies. We offer good terms and conditions of cooperation, and we customise our solutions to meet the needs of our Clients. The supply of minor hardware and consumables naturally supplements the operations connected with maintenance of IT services and infrastructure of our Clients. 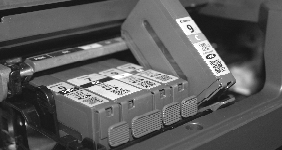 For example – thanks to interactive monitoring of the devices, we are able to foresee when the printer will run out of toner. We will supply it in advance, to let you avoid problems with printing out these few pages of an important contract, whenever you need it. The presence of our staff with the Client, lets us replace the faulty power supply adaptor in the laptop and suggest replacing the disk, as soon as its observable parameters indicate that it needs replacement. We will also supply a new display monitor or tapes to backup copy devices.